First of all, I want to thank everyone for their support yesterday. Some people I don't know might say ignorant and hurtful things for no apparent reason, but some people I've never met might offer an outpouring of incredible love and support. I can't tell you how much that means to me. I know I still have plenty of work to do with my emotional eating - my biggest problem yesterday, I think, was being caught off-guard. I guess I just thought that I was past the point where people would yell mean things out car windows. People haven't changed - I've changed. Some folks in this world are jerks, no matter what size I am. I can't change the world, I can only change myself. And I am trying to do doing just that - brilliantly. Mix 3 cups of flour with 5 egg yolks and 1/2 teaspoon of salt. Add water as needed - the original recipe said it was just a splash, but we used maybe a quarter cup. You want a firm but sticky dough. Knead for 10 minutes, then let it sit for a few minutes to make the rolling process easier. Peel and slice 1 pound of eggplant, sprinkle with salt, and place in a colander. Leave for 1 hour to draw out the bitter juices. Rinse and dry. Finely chop and set aside. Heat 2 tablespoons of olive oil over medium heat in a medium-sized saucepan. Add 2 finely chopped garlic cloves and 1 finely chopped small onion and sauté gently for a few minutes. Chop 2 roma tomatoes into a small dice. Add diced tomatoes to the garlic and onion along with a tablespoon of dried basil. Cook for about 15 minutes at low-to-medium heat, stirring occasionally. 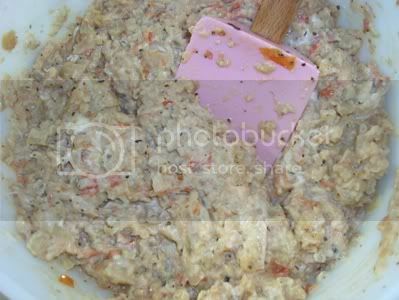 Add the eggplant and cook until the mixture reaches the consistency of a thick paste. Mix in 1/4 cup of goat cheese. Set aside to cool. 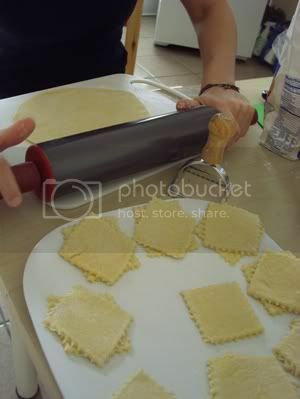 With a rolling pin, roll the pasta to paper-thin (we were not nearly patient enough, ours were good but could have been better). Cut out your pasta shapes and set aside. I have a ravioli cutter but you could definitely use just a glass. Per the suggestion of the recipe for the filling, we put the eggplant mixture in a piping bag in order to control how much went into each piece. My only complaint about the recipe is that I used two different recipes for the filling and the pasta, so we ended up with a lot of extra filling. We also didn't put a ton of stuff in them because I don't have a ravioli filler pan, so we didn't want to overfill them and then have them burst in the water. Oh, well ... it's going to be delicious in an omelette for my dinner tonight. 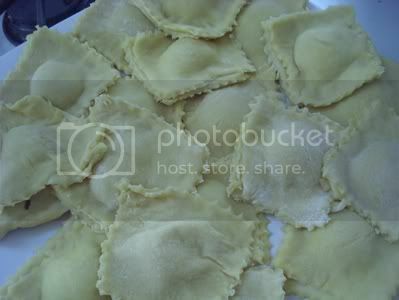 Put a small amount in the center of each pasta square, being careful not to overfill. Wet the edges of the pasta with water (or the egg whites reserved from making the pasta dough) and lay another piece of pasta on top. Gently but securely seal the pieces together. For a first attempt, I think they turned out lovely! 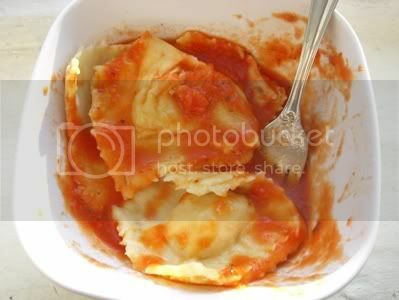 Bring a large saucepan of water to a boil, then add the ravioli a few at a time. (You don't want them to all stick together!) They will be done cooking when they float to the surface, about 4-5 minutes. So delicious. I only ate a couple because I wasn't terribly hungry, and I sent Lorelei home with two big containers (6-8 ravioli each), and I kept 4 for myself for lunch or dinner tomorrow. It was a lot of work but definitely fun, and it was certainly something I'll make again! Good for you for overcoming the idiots yesterday! Sorry you had to feel that way. I have eggplant biases so I'm not sure I'd love this! Eeeek! Is it like Eggplant Parmesan? Looks yummy!! It also looks so time consuming! Homemade pasta is delicious though. Hope you had fun on your run! That food looks DELICIOUS!! I just went back and read what happened earlier this weekend, and I am so sorry you are going through this! Just know that lots of people have had this before (myself included) - and the most important thing is what you do afterwards. To pick yourself up, dust yourself on, and move forward - your "self" will match your "body" soon. Just keep on keepin' on, girlfriend. You can do it!! Making my own pasta sounds great! I have always been too scared to try, I should just do it and hope it turns out. Yours looks delicious.